We have known for some time now that a new sit down restaurant was being added to the area behind Pizzafari. Disney on Friday released some additional details. In short, Tiffins (which is an Indian English word for a food container used while traveling). 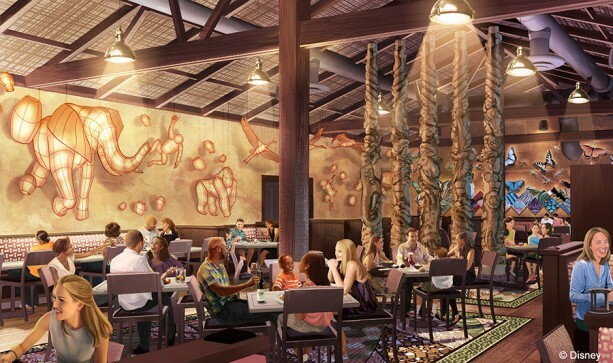 The theme, in keeping with the name, is cuisine from the lands of Disney's Animal Kingdom. Considering there really isn't a Dino or Avatar cuisine, I am thinking it will be an African-Indian fusion. Which is, of course, the style of Sanaa. I suspect this restaurant will have similar flavors. The place will also be a signature. So it will be high quality and naturally, high price. For Dining plan people, this will be a two credit joint. There will be outdoor water views. The Discovery River which separates Pandora from the hub is right there so that is the water you will see. I suppose you may have views of the floating mountains which are being installed now. Disney is saying this will be open in 2016 and we are hearing Spring, which is exactly the same time frame as Rivers of Light and the Sunset Safari.